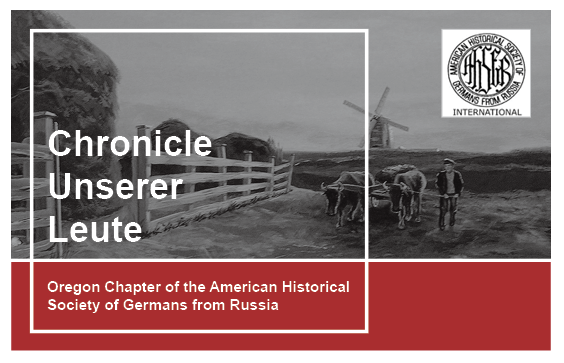 Thank you for your interest in the Oregon Chapter of The American Historical Society of Germans from Russia (AHSGR). Our organization is a resource for learning about the rich history and heritage of this ethnic group. ​Migrating primarily from the German speaking areas of Western Europe beginning in the 1760's, these colonists settled in many parts of the Russian Empire where they built stable communities, established farms, churches, schools and businesses in their new homeland. We will show you how to access a large collection of short videos online. These are perfect for sharing at home with our families. We’ll also have a special showing of a 25-minute video from Germany related to the Denmark settlers. It has narration (in German) about the settlers’ journey from Germany to Denmark and on to the Volga interspersed with folk music performances.